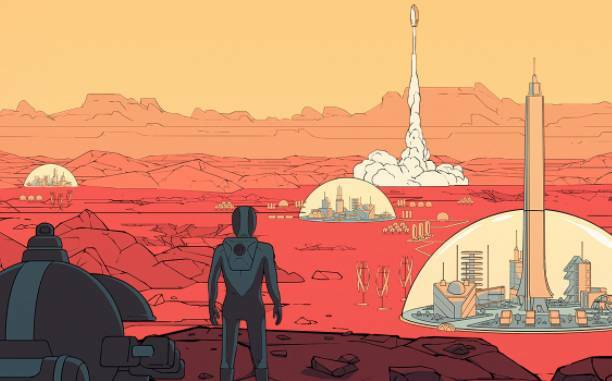 Surviving Mars is a city-building game set on Mars published by Paradox Interactive and developed by Haemimont Games, the creators of Tropico. Much like that game, they have done their best to inject a sense of personality into what could have been a pretty cold, sterile game. There’s a couple ways they’ve done this: through the colonists, who can have a variety of personality traits as well as specialisations, (and can be renamed, like all the units); and through the addition of mysteries (more of which later). This elevates it above standard fare, and while I did encounter a few gripes, this was more to do with the controls and amount of information to manage on a PS4 (as opposed to a PC) than any inherent problems. Before you can even begin to think about colonists there is the first of three stages. From the start screen, you can choose your difficulty by way of selecting your sponsor (there’s a cheeky nod to “SpaceY”) with each sponsor offering different perks and starting funds. Once you’re all set up, you can then choose where on Mars to land, with further indication of difficulty shown by the proclivity of dust devils, dust storms, meteors and cold waves. It also shows how abundant the three main resources are: metals, concrete and water (I guess they discovered it after all). I would recommend selecting Quick Start from the main menu, just to play for an hour so and get an idea of how things work, before starting a full game. Without some prior knowledge it’s hard to know how important some of the starting factors of the various sponsors are. Already from the screenshots you might notice one problem. I played this on a 50-inch screen and even on that, sitting quite close, the text was difficult to read. Once I adjusted it, it wasn’t too bad, but it was never really possible to casually speed read. When the storyline kicks in later in the game it’s text heavy, so may cause a problem for some with smaller screens. I just dived in to Surviving Mars as a way to discover how intuitive it was to play. I have a PS4 copy, so the controls were always going to be more difficult to master than a PC, and indeed, despite the hints that appeared briefly at the top, it was five minutes before I even figured out how to move a unit. Once the controls became second nature it wasn’t such a problem, though even now it feels slightly counter-productive not to be able to select a unit with X and press X or another button on the target to interact with it. (R2 and X will do the job.) But the controls are what they are, and Haemimont Games have done their best to map the variety of functions to every available button, it’s just a case of training those fingers. Once I could take control, the fun began. When you first land you have no colonists, just your trusted band of merry drones and three vehicles; one for transporting, one for exploring and analysing anomalies, and one that controls and repairs your drones. My first problem here was differentiating between the three. They look incredibly similar – same colour and same shape. After a while you learn the subtle differences, but it didn’t need to be a problem in the first place. The first stage is to create a habitable home for your colonists. This involves building a drone hub, developing a power supply, and setting up a dome. This dome then needs supplying with oxygen and water. One important thing to note, which I didn’t immediately grasp as I tried to tell my drones what to do, is that the drones are automated. This is a great feature; the vehicle that controls the drones has a small radius of influence, and anything that needs doing within that radius will be done by the drones assigned to it, from building and repairing, to collecting resources. You begin with one drone hub building (you need to purchase more in rocket supplies, or research it) which has a wider sphere of influence. Once I grasped this, I stopped trying to build things too far away. To build most things you need concrete, so one of the first things I did was build an extractor. Metal deposits are also needed, and are found through exploration, automatically collected by the drones if they are within the drone control influence, or by the harvester. On my first attempt I did hit a problem, as I built the concrete extractor too far away from drone control, so it was filling with waste rock and then stopping. I tried to use the excavator to take the waste rock (as it would take the concrete) but it wouldn’t, and I was pulling my hair out for a while. Not until I built a nearby drone hub did the drones begin taking it away. I occasionally hit small problems like this which weren’t explained in the game’s encyclopedia. For instance, buildings need constant maintenance; without it they fall into disrepair and you can’t even call for drone maintenance. A spanner flashes above it. I had many buildings stop working because of this, and the text said that a drone was needed to repair it, but I couldn’t send one! I had cables and pipes fail but they were repaired automatically. Eventually (I’m not sure what happened) they did begin to repair, but not until after I had destroyed a few and rebuilt them. In hindsight, it was probably because of a lack of resources to repair, but there was nowhere that said that, that I could see. While you’re slowly gathering resources and getting the first dome set up, it’s important to remember your often unattended explorer vehicle (it would be handy to be able to set this to automatically head off to any anomalies that are found). From space, you can scan the sectors around you which reveal the anomalies. Scan these with your explorer to unlock breakthroughs in the research screen, and don’t forget to queue up your research items! The breakthrough research costs more research points than the standard early research items, and I made the mistake of queuing these up, making me wonder if my scientists were doing anything at all! Scanning anomalies can also provide raw materials and money, which is needed when ordering supplies from Earth. My first playthrough was messy: I had solar panels and windmills all over the place, resources stored haphazardly throughout, and rockets landing too close or too far away from structures, but despite all this I did manage to build my first dome and equip it with living quarters and other buildings. As your power network grows so does the potential for some part of it to fail, so I learned on the first playthrough to be as efficient as possible when setting up pipes and cables. All this was standard city-building mechanics, so for anyone used to this type of game it wouldn’t be a very steep learning curve. The only problem, and possibly caused again by the PS4 controls, was accessing information. Usually, tutorials will hold your hand through the first hour or so, with giant arrows pointing at areas of useful information, but not here. Bringing up the building information screen whileR2 presents you with horizontal options, so I scrolled left-to-right on these, only realising later that there were further options by scrolling down to what I thought were just information bars. Again, just a small teething issue, and in a way, discovering these is part of the fun. You just have to take your time and explore and once you know it’s there, it’s not a problem any longer. Before the first dome is built it’s largely a mechanical process, though if I had landed in a more hazardous area, no doubt those dust storms would have ravaged across my settlement and caused multiple failures. The option for a tougher challenge is there, it depends on how you like to play. I should mention that I began to notice aesthetic changes in my settlement as it was now a few Sols old: a gradually thickening layer of Martian dust started to cover everything. Zooming in allowed a closer look: an old concrete extractor sat rusted and distressed in the way that forgotten industrial factories on Earth do. And as I was to discover later, this changing aesthetic added extra personality to the game: old structures stood out from new, and one of the storyline mysteries even temporarily turned everything green. The average player would perhaps have resupplied from Earth a couple times by now, buying more materials or prefab buildings, but it’s the first rocket of colonists which really excites. It’s also where I made a mistake on both my playthroughs. Back on Earth is a list of applicants that can be filtered by specialisations and traits, so of course, this being Mars and all, I wanted all the best people, the scientists and botanists and so on, with all the best traits of bravery and intelligence, and no hippies. To begin, you can only transport 12 colonists at a time, so I filtered them down to the 12 best applicants. The problem there is you need workers to man the metal and rare metal extractors, to work in the factories and the grocery and the school. Many of my first colonists were constantly on the point of starvation as there was no one working in the grocery or the diner. Alerts were popping up, and I was looking at the pile of food available and scratching my head. It’s a bit nonsensical, and breaks the immersion, but also adds to the strategy element of the game. Having these first 12 colonists survive 10 sols is the second stage. Until you have proven Mars is habitable, no one else can visit, so this stage becomes about exploration, analysing, and preparing for the next invasion. It’s a little frustrating, as by this point you’re resupplying from Earth all the time, and depending on your sponsor, may even have run out of money altogether. You may even have another dome ready to fill, so the impatient ones of us will want to skip this bit. This is where a sandbox element could possibly be good to add. It’s important when you build your dome to build it adjacent to some rare metals. Workers can then extract these (unless they’re all smarty-pants working in the research lab) and they can be exported back to Earth for cash, which is pretty much your only source of income beyond sponsorship and donations, at least until further into the game. Again, this is possibly where a sandbox version would help the casual player, as running out of funds can happen quite quickly. Once those first Sols have been survived, it feels as though the game really opens up. You can start importing colonists as fast as you can throw up domes, the research tree is making more buildings and upgrades available, and a semblance of a storyline will begin to kick in. At the start screen you can be specific about which kind of mystery you want to explore, or make it random. For me, the colonists began hallucinating things outside of their dome, and as mentioned, everything turned green for a while. Before this happened, I had been taking everything at face value, not expecting anything too wild to happen. I imagined any mysteries would be largely text-based, as most of the story so far had been, so for it to have a physical effect on my playground was a nice touch, and left me wondering what else might happen. Increasingly, the colonists personalities begin to have greater influence on your decisions; you get celebrities, geniuses and tourists; and your pool of applicants begins to dwindle to the point you start accepting the lazy and idle, or perhaps the chronically sick. Bad apples can appear in the domes. Trouble can rise up. If so moved you could throw up a dome and filter all the undesirables into that, with its own repercussions. I thought I was nearing the end of my research ladder only to discover, by moving the cursor to the right, that there was even more to the ladder. As you get deeper into a playthrough, the deeper the gameplay becomes and the more options become available to you. This, combined with the multiple mysteries and the various difficulties you can set yourself, makes for quite a replayable game. Build superdomes and watch the politics of the people play out as colonists rise to prominent positions of influence. Spread your technology across the surface. Overcome disasters as meteors shower your domes and cause them to crack. What mysteries are awaiting? There are many stories waiting to be told, and as a fan of city builders since the first Sim City, I found Surviving Mars an engaging take on the genre, and as someone lacking a decent PC rig, grateful for this addition to the PS4 line-up. It’s not without its faults but they are largely due to the learning curve and PS4 controls, so once you’ve mastered them it’s a great builder.